Jersey's Kim Ashton completed a clean sweep of gold medals at the 2015 Island Games after winning an appeal over her first place in the Town Criterium. The Jersey team were initially given a one-lap penalty by race officials for arriving late to the start, but it was overturned by the Games appeals board. 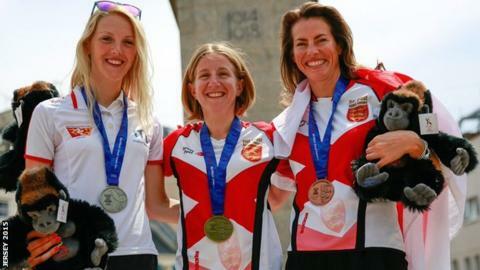 Jersey's Clare Treharne took bronze, meaning Jersey won team gold, giving Ashton six gold medals out of six. Isle of Man's Liz Holden finished second in Thursday's race. Ashton had already won four cycling golds at the Games, having won individual and team gold in the time trial and road race. Laura Chillingworth joined Ashton and Treharne in winning team gold. "This is the resolution to a day of uncertainty for Jersey's Island Games cycling team," said BBC Radio Jersey's cycling reporter Chris Stone. "British Cycling commissaires were unable to confirm the results last night after Jersey appealed against their one-lap penalty. "Jersey riders and officials have expressed their disappointment at the delay and uncertainty in announcing the results. "Supporters were left disappointed after waiting around for the medal ceremony of what was one of the Island Games showpiece events." Ashton received her medal at 1315 BST, almost 24 hours after the race. Meanwhile in an action-packed race there was a potentially serious crash on the finishing straight between Zoenique Williams, of Bermuda, and Ynys Mon rider Ann Henson, who were taken to hospital. There had been doubt as to whether the men's Criterium would start, but a safety meeting decided it would go ahead.